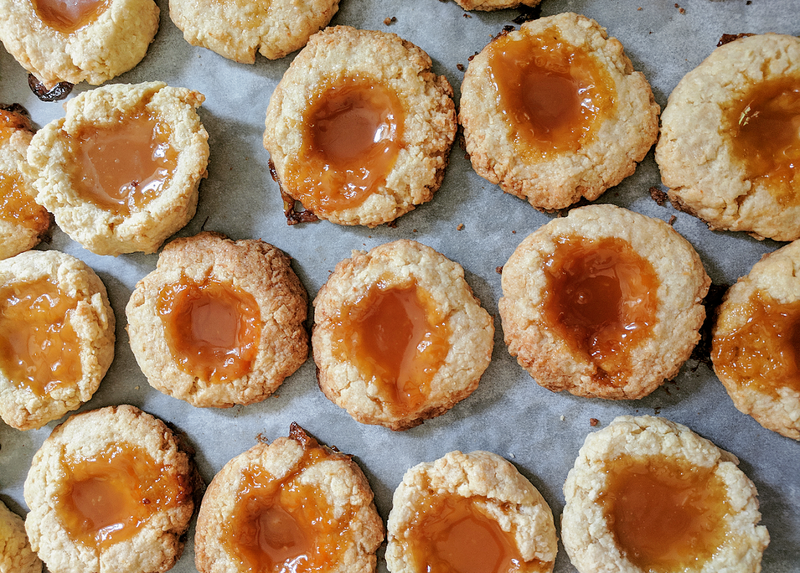 Crumbly, chewy and sweet, if you're looking for a delectable treat to brighten up your day or add something special to your high tea, my Caramel Crumble Cookies are just what you need. They're really easy to make and freeze well, so you can whip up a last minute batch some leftover caramel sauce, or experiment with jam, chocolate sauce or any other filling! Preheat oven to approximately 180 degrees Celsius and line a large cookie tray. In a stand mixer or using a bowl and a handheld mixer, beat butter and sugar until smooth. Add remaining ingredients except extra caramel and blend until just combined. Using clean hands or an ice-cream scooper, roll mixture into balls and make a small dip in the middle of each one for the caramel. Spoon around 1/2 tsp into each one, being careful not to overfill. Place in the oven and cook for approximately 15-20 minutes, or until cookies start to brown. Serve at room temperature and store in the fridge or freezer.